Powernaut 2005 is a hero created by Scott Eiler. In mid-2005, Earth underwent a series of reality shifts. One of these led to a plague of wish fulfillment. Aliens who were secretly resident on Earth, saw the plague coming; they used it to come out in public - and become leaders of Earth. During that plague, Karl Scribner subconsciously wished for a hero like the previous Powernauts. He got a new Powernaut, apparently with no previous existence before then. 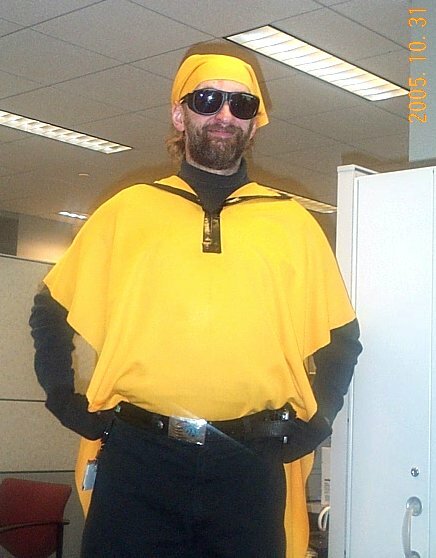 Karl acted as this new Powernaut's business manager. The Powernaut sensed the great power behind the reality shifts. Throughout 2005 he made common cause with the aliens, and fought against others who would misuse the reality shifts. This led to him fighting the aliens' autonomous robot creature, Spanker 4. The Powernaut prevailed, but Spanker 4 shifted Earth's history one last time: most of Earth's superhumans and aliens had been rendered powerless. Many had been imprisoned by a reality-shifted U.S. Government. But after more reality shifts, the superhumans became free. At one point in 2005, the Powernaut was involved in changing the track of Hurricane Katrina. He and his business manager were sued for this, in a civil suit by the City of New Orleans. The case was settled out of court, and the Powernaut accepted court oversight. After 2006, the Powernaut (and his new business manager) built a new Power Patrol of young superhumans. They did a variety of pro-social stuff (with some pro-business payoff). In 2009, the Earth's orbit was changed. Life was still possible, but global cooling became a problem. By 2011 it had become *such* a problem, that human life was pronouced doomed by 2022. The Powernaut worked with other heroes (particularly the Mighty Tim) to try to reverse this and/or save refugees. But the reversal effort failed before the end of that year. Toward the end of 2011, Earth was assailed by two factions: "Black Mages" who started exploding volcanoes, and the Infrared Sunbreaker Choir which started throwing meteors at the planet. The heroes made one last effort, to cause one more reality shift. They sent Leo and the Powernaut, to a power nexus in the Dreamtime. The Black Mages, the manipulating superhuman Eric X, and Ellipsis all opposed them. During the resulting battles, several previous Powernauts appeared from within the current Powernaut! He had been linked to them, through the Pentahedron which he carried. The Powernauts prevailed. But on the advice of Powernaut 1968, the Powernaut of 2011 started a reality shift which split his Earth in two! One Earth would stay behind, for superhumans such as Ellipsis to try to fix. The other would be a refuge for Earth's humans in case this failed. The Powernauts set up dimensional doors, so all Earth humans who weren't obviously evil could choose which world to live upon. All Powernauts now reside upon the new Earth. This is known as "Earth-SW12" or "Earth-Power". The Powernauts operate a Power School there, to train their world's young superhumans. The Powernaut of 2005 serves there, as "Coach Powernaut". This Powernaut has *usually* been inclined toward action, and heroic to a fault. He may appear goofy and easily distracted; he usually lets others manage his affairs. But when confronting evil, few can keep up with him. He may be the most strong-willed of the Powernauts. The Powernaut has heightened human abilities, especially strength. Physically he is among the strongest humanoids in the universe, or indeed any universe. He can fly under his own power. But most importantly, the Powernaut (like every Powernaut) understands every superhuman power he is exposed to. He does not absorb these powers, but he instinctively knows the powers' limitations. At least at times, the Powernaut has carried a Pentahedron. With it he has easily broken through the most powerful barriers and hypnotized Ellipsis, one of the most powerful minds in the world. 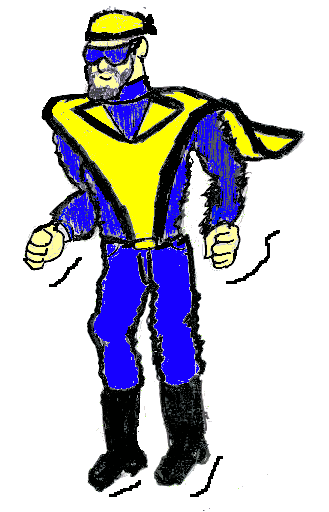 The Powernaut dresses in blue jeans and turtleneck sweater, black boots, a yellow poncho with cape, and a yellow bandana. He has glowing blue eyes, which he usually covers with blue wrap-around sunglasses. He has black hair including facial hair, but no one has admitted seeing how much hair he has under his bandana. The main contribution of this entry, is the overview of Powernaut 2005 history. Go figure. I suppose I should be writing this on the Powernaut's birthday, not *my* birthday. The trouble with that is, I can accurately date and place the origins of Powernaut text stories and of Powernaut comics - but in neither case was the Powernaut of 2005 the first one portrayed! *This* Powernaut got his origin on various barstools in the northwest suburbs of Chicago, between August and October 2005. But he's the most published Powernaut, and the only Powernaut to appear in public. So it's about time he got his Wiki. The artwork is based on the first Powernaut sketch, published with the original text story. (signed) Scott Eiler, 3 May 2016. This entry and all characters within it are copyright © 2016 by Eiler Technical Enterprises.